Networking Mindset – Series M&A Strategy 9 – Optius Inc.
One of the mosts populart reason to why SMEs use M&A is the new clients that comes with the target company. Especially in cases for SMEs, your sales power may not be enough to gain enough attention from that buyer you’ve always wanted to get in touch with. But if you’re executing an M&A scheme, there’s one thing to keep in mind. What you’re buying. In general, acquiring a business can be done in 2 ways. Either by buying the target company’s shares, or buying only the business and the assets related to that business from your target company. If you’re intended to proceed with the former method, you won’t have much to worry about but if you’re intended to go with the latter for the purpose mentioned above, you may want to think again. If you’re acquiring solely the business and not the company itself, you’re risking of losing not just your potential clients but also your employees. Acquiring your target company is like buying your drink together with the cup, but buying only the business assets means you’re transferring the drink in the cup into yours and you’re risking of spilling the drink during the process. So as mentioned before, be sure that what you’re about to buy matches your purpose or otherwise, you may be on the verge of hurting your business. Especially when what you’re after is intellectual rights or contract rights i.e. exclusive agent etc. that may not always be inheritable. You may not always finish your M&A projects, but often times the information you acquire through the process can be a valuable asset for your business. The important thing here is to constantly look for information that leads to the next ideas and possible partnerships. Keeping such mindset leads you to a network that’s centered around yourself. In our case, we never finish an interview with nothing, even if the topic drifts to something other than an M&A. It could be setting up a meeting with someone new or putting that person into our list in case something interesting pops up. As long as you keep providing something, that leads to a new project or even new clients, which expands our network. 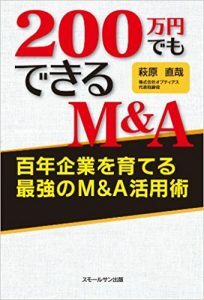 When y0u’re managing a company, even if its not related to M&A, you get to know so much information and most of them probably does not relate to your current business directly. But instead of eliminating that information from your mind, think if there’s anything you can benefit from it or benefit someone with your service. It may lead you to the brighter future that lies ahead which you just didn’t see. In this series, we’ll explain why M&amp;A can not only save many SMEs in danger but can also be a handy tool to strengthen your business quickly and efficiently. Strengthening Small and Medium Sized Enterprises with 3 key concepts; information, planning and networking. We engineer and redesign SMEs through our unique information network and intelligence.